There are several causes for a client's enrollment status to be reported as Unknown on the RSR. These reasons and solution are provided below. The case closed date is required in order for CAREWare and the RSR to know when the enrollment change occurred. The same is true if the client is deceased; CAREWare needs to know the date of death to report this properly in the RSR. The client's vital status will also need to be changed to Deceased in order to properly reflect this change on the RSR. If you don’t know exact dates when these occurred, but want to report them appropriately, you could estimate or simply (and arbitrarily) set the Date Closed to 12/31/2011 (or the end of the year when you know it occurred). You might run a custom report and sort it by enrollment status to get a list of clients by each value. The RSR does not have a value for Inactive/Case Closed. Clients set to Inactive/Case Closed, even with a case closed date, will be set to Unknown. For these clients we recommend that you reclassify the client's enrollment status as best possible given the available options--referred (which also includes discharged), removed, etc. We’ve had a few questions about how CAREWare reports Enrollment Status in the RSR, especially with regard to clients who are “discharged” or have completed a service at an agency for some reason. The 2017 RSR Instruction Manual clarifies that Referred should also include those who are Discharged. See page 41 of the manual for additional information regarding this enrollment status definition. 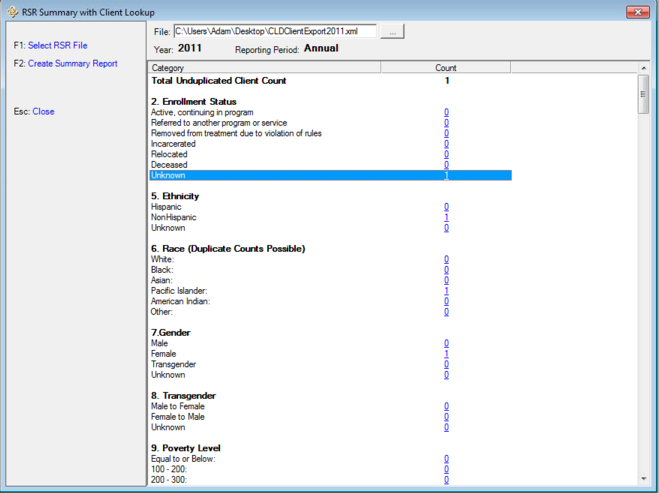 To find clients with an unknown enrollment status please refer to using the RSR Client Viewer. In a future build of CAREWare the enrollment status Referred will be updated to reflect this new definition.